1 high-ranking music artist will be selected for a one-on-one mentoring session with Curt Smith of Tears for Fears, who have sold over 20 million albums worldwide throughout their 25-year career. The winning artist will be selected by Curt Smith; all high-ranking artists from the Music Channels in November will be eligible to win. 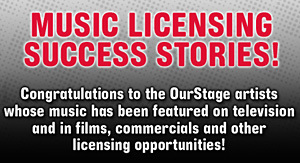 Prizes will be awarded according to the OurStage monthly competition terms and conditions: No additional expenses covered.